« Jenni Doyle’s Album Release Party! 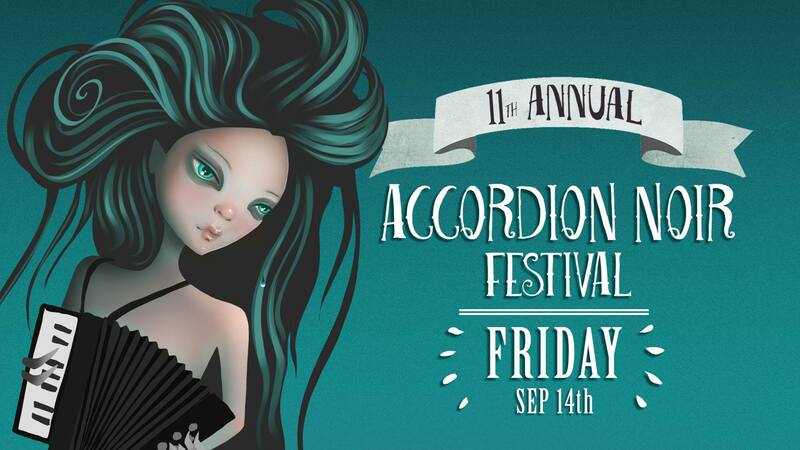 Roaring out of the gate with a slate of festival luminary deep cuts from Accordion Noir’s distant past, rediscover why you fell in love with the bent, circus-like sounds of noir accordion all over again! Singer/author Geoff Berner (geoffberner.com), klezmer rebel and the patron Saint of the Accordion Noir movement has been involved in just about every year’s edition of our festival, showing an entire generation of accordion punks that another, less bubbly, world is possible. Legendary busker-king Jason Webley (jasonwebley.com) returns to our festival for the first time since its second instalment, prepared to howl like a werewolf biting Tom Waits, spin yarns like a Russian sailor and break your heart like a forgotten dream. “Unclassifiable” avant-garde composer Amy Denio (amydenio.com), the only performer we’ve hosted to have worked with KMFDM, Chuck D AND Pauline Oliveros, is back at the Accordion Noir Festival at long last… as we’ve finally just about recovered from her appearance at our inaugural year back in 2008.